Our professional decking and patio cleaning and staining service revitalises dirty and washed-out decking, making it an attractive focal point of your garden. Patio cleaning is carried out similarly to as mentioned on the pressure washing page. however we can also restore your garden decking to its original condition with high pressure cleaning and optional stain or oil treatment and transform the appearance of greying deck. Our service is available throughout Fife including Dunfermline,Kirkcaldy,Glenrothes and Cowdenbeath. Over time deck becomes ingrained with dirt and algae that is not only unsightly but also makes the surface slippery and dangerous. Using our commercial petrol pressure washing equipment we can set it to an appropriate power setting and safely but effectively remove all dirt, algae, mildew and other staining. This avoids the need for harmful chemicals or bleach which can damage wooden decking and surrounding lawn and plants. After cleaning decking we can then treat it with stain or an oil of your choice. This not only provides a protective seal but transforms the appearance of decking making it look like new. Stain or oil transforms grey deck suffering the effects of sunlight and protects it against future exposure to UV light. Once the deck is dry after jet washing we apply the stain or oil using deck rollers. One coat is sometimes sufficient but two coats are generally recommended for a deeper, more attractive colour and added protection against weathering. Our decking cleaning and maintenance services are available in Dunfermline throughout and beyond Fife. Both stain and oil protect and add colour to garden decking but stain has a more dramatic effect and is most suitable if you are looking to significantly alter the existing colour or restore grey, weathered deck. Oil can be clear or coloured and its final colouring is influenced by the original deck colour. In some ways it is fair to say that it enhances existing colours rather than creating a new one. Oil works by penetrating the wood and replacing lost oils whereas stain provides a protective barrier over the top of it. For further information or to arrange a free no obligation quote call 07856 539498 or fill in our online contact form. 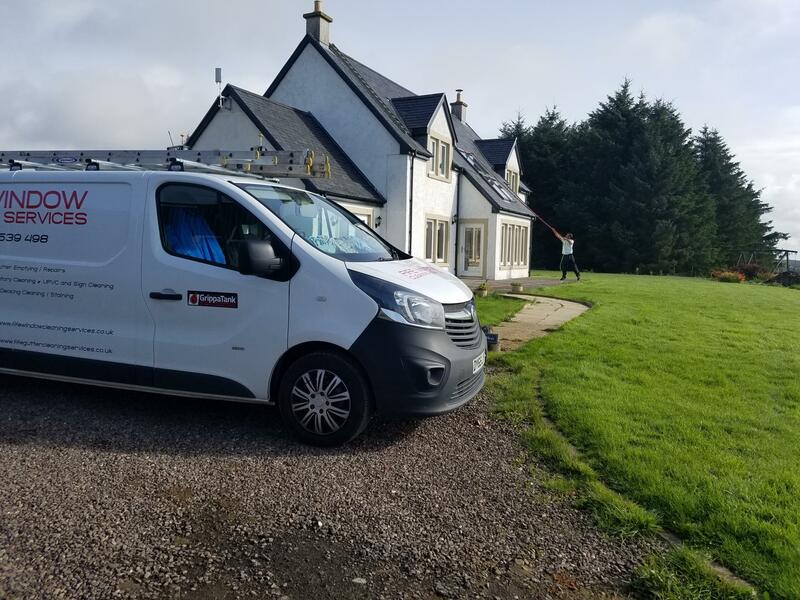 Fife Window Cleaning Services provide a range of exterior cleaning including driveway and patio cleaning, conservatory cleaning, window cleaning, gutters, solar panels and cladding cleaning available in Dunfermline, Kirkcaldy, Glenrothes and surrounding areas.